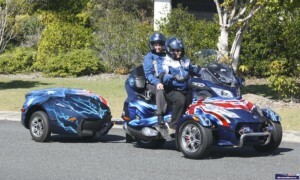 People who ride Can Am Spyders tend to be into stability, comfort and an added level of safety. At least that’s the way it seems. As motorcycles (and a few diehards might argue they are NOT really motorcycles), they are a bit quirky. They are, of course, trikes. However, with two wheels in the front, they are a world apart from what biking purists think of as a trike. 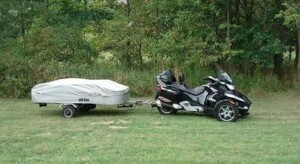 Having said all that, when it comes to towing a trailer, the Can Am has some real advantages. First of all, the higher end models are actually designed for towing (for 2017, that includes the F3-T, F3 Limited, RT & ST). Their weight limits are stated and, if you get the semi-automatic transmission, there’s even a towing mode. You won’t find that on any two-wheeled models we’re aware of. From a riding perspective, what sets these beasts apart is the way they handle turns. Experienced motorcycle riders may find it hard to get used to taking turns more slowly and not leaning. Snowmobile riders, on the other hand, feel right at home. The fact is, while the vehicle remains extremely stable in a turn, a new rider may feel like they have to hold on for dear life just to stay aboard. It’s the same effect one experiences in a car. If you’ve ever taken a high-speed turn in a Miata, for example, and you’ll know the feeling. Now, imagine feeling those G forces sitting on a saddle, not in a bucket seat. When it comes to towing, however, that stability can actually be helpful. Once you learn to handle turns the right way – that is, scrub a lot of speed going in and accelerate on the way out – the fact that you have a trailer behind you has little effect on the way you ride. That assumes, of course, that the trailer is designed to be towed behind a motorcycle and the hitch is properly designed and installed. Like tow-behind motorcycle trailers themselves, Can Am Spyders are designed with touring in mind. The original concept seems to place them somewhere between a sportscar and a two-wheeled motorcycle. Like a bike, you’re exposed to the world around you, but you feel like you’re in a more stable riding environment. It’s been said that first-time motorcyclists find it much easier to adapt to the Can Am than do experienced two-wheeled riders. Perhaps that’s one reason why the Spyder has not really caught on more than it has. Their market is not current motorcycle riders, but motorists seeking a bit more adventure in their travels. For now, at least, it seems that an older rider seeking something with more stability, is likely to go for a Harley-Davidson trike, not a Spyder. Price is another reason. 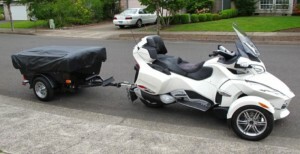 You can buy a base model Honda Civic for the price of a Can Am touring machine and as much as you may enjoy it, the Spyder simply cannot be your only vehicle. There are always used ones for sale on Craigslist and other sites, of course, which can ease the pain a bit. For that reason, gently used may be the best way to go. Just be sure to review the descriptions carefully and be sure the vehicle is mechanically sound. While sales remain high enough to keep them in development and production, you certainly don’t see Can Am Spyders on the road every day. What’s more, unlike trikes with two wheels in the rear, they have never been fully accepted by the biking community. Reviews in motorcycle publications can often be critical or even dismissive. 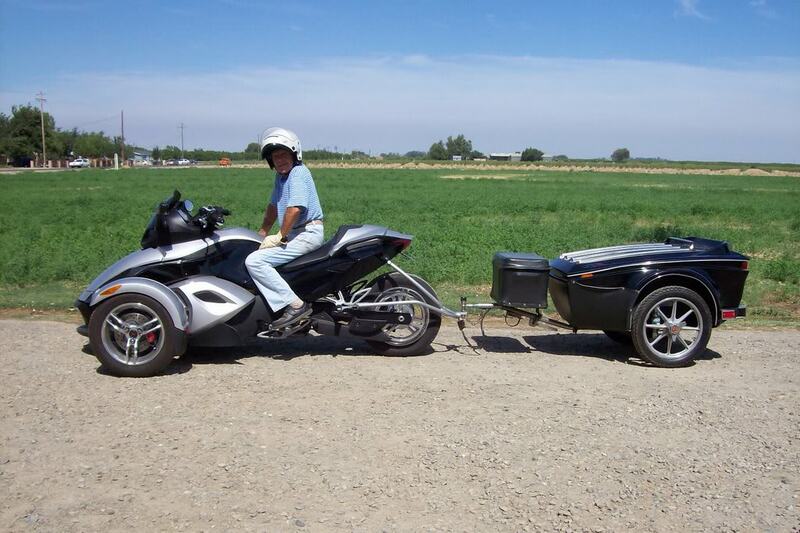 Perhaps that’s why Can Am Spyder owners tend to keep to themselves, holding their own rallies and meet ups rather than showing up at popular biker events. It would appear that, at least for now, the Can Am Spyder will remain a vehicle loved by a devoted few, but scorned by the biking world in general. However, when it comes to long-term travel and extended touring, they offer some clear and obvious advantages. They can carry more cargo to begin with and they are extremely well suited for towing – within certain weight limitations. 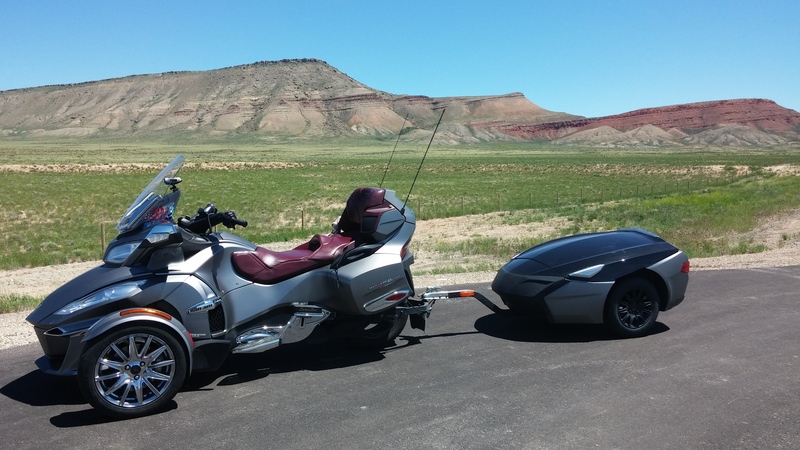 So, if touring and/or camping are your primary reasons to own a motorcycle, the Can Am Spyder is at least worth considering. You may not be invited to join the local motorcycle gang, but you certainly could find some friends who share your interest in long hours in the saddle and many relaxing days on the road. Part 1. You Need Trailer Insurance? Get Lost Trailers LLC © 2014. All Rights Reserved.